Had a spare couple of hours so I thought I’s plough onwards with my rewatch of Blake’s 7. It seems fitting that I’m going for this tonight. I saw the sad news online earlier this week about the passing of composer Dudley Simpson, who was responsible for Blake’s 7’s awesome theme music. It was quite emotional hearing it just now. A fantastic piece of work. Simpson was an Australian composer who was musical director of a Ballet company. He moved to the UK as a guest conductor and went on to become Principal Conductor at the Royal Opera House in Covent Garden. Aside from his work on Blake’s 7, Simpson also provided a great deal of incidental music for Doctor Who. His credits include some of my favourite stories: Jon Pertwee’s introductory turn in Spearhead from Space, Genesis of the Daleks and The Talons of Weng-Chiang. I wish his family the best and give thanks for the legacy that lives on every time we hear the familiar sounds he put together. So, whose court martial are we going to see? I can’t remember. The two snap to attention when they hear a couple of higher-ups approaching. These two are talking about a lady with “all the sensitivity of a plasma bolt.” I don’t need three guesses to figure out who that could be. In they go, followed by some more complaining, then another guy shows up. Oh my God, it’s John Savident. Fred Elliot from Coronation Street. He goes in too and the two grunts reveal through more skilful expository dialogue that he’s called Starkiller. Cool name. Sure I’ve heard it somewhere else recently! He’s a big deal. 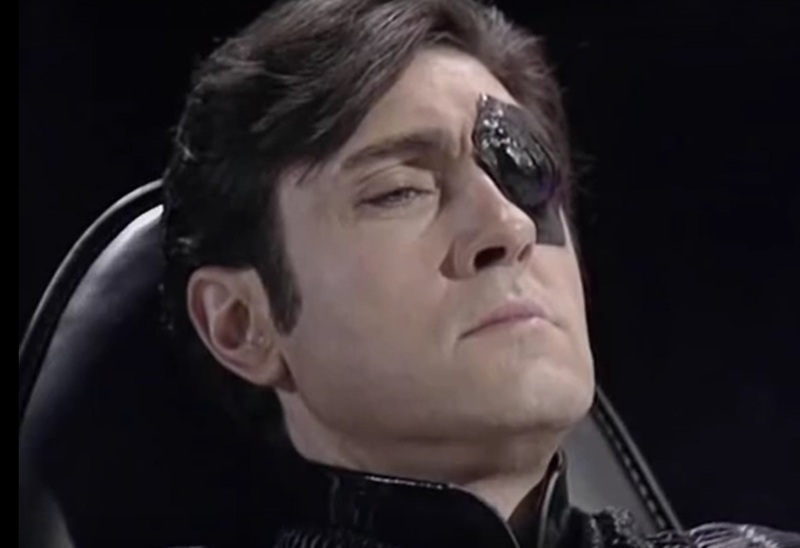 Cut to Servalan talking to someone about him, saying that with him as Arbiter in the case, they can be assured of the guilty verdict they want and that it will not be questioned because of the respect in which he is held. Who does she want sent down? Oh, it’s Travis. He’s the Lt. Manion of the piece (house point for cracking that reference in the comments). He’s charged with war crimes – the murder of 1000 civilians and he pleads not guilty. I suppose it was hardly likely for dramatic purposes that he would have entered a guilty plea. 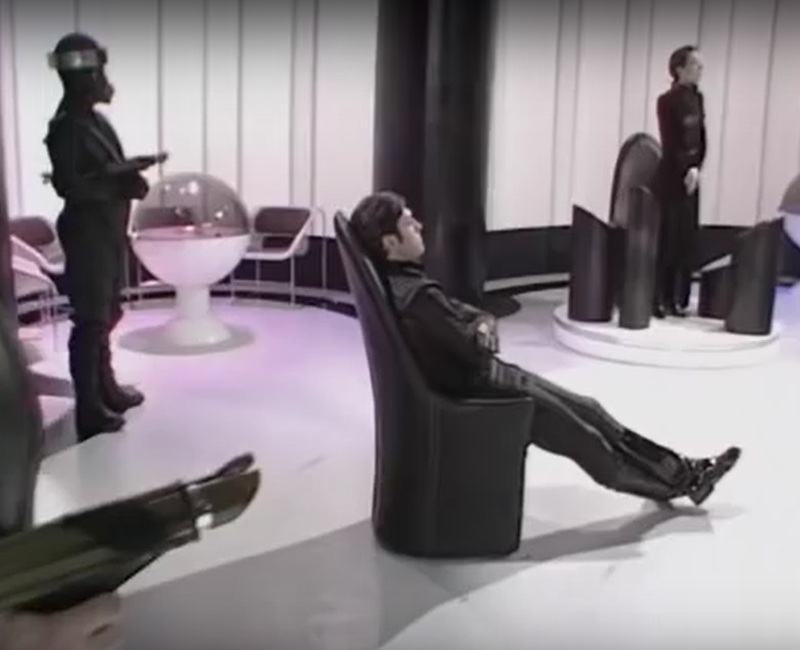 The idea here seems to be that Servalan is trying to ensure that Travis gets convicted of this and that he gets the maximum possible punishment. He seems pretty cool about it, however, sitting back in his chair with a scheming look. Meanwhile, 8 minutes into the episode, we cut to Blake and the Liberator. It’s a testament to the strength of the series that it can afford to step away from its protagonist for such a protracted period of time, devoting time to the other side. This is yet another indication of just how ahead of it’s time the show was. Can you imagine the first 8 minutes of a Star Trek episode without seeing a member of the crew? Anyway, Blake has found some backwater world and seems intent on teleporting down to it on his own. Avon isn’t too happy about it, making a particularly barbed comment about Blake getting people killed. 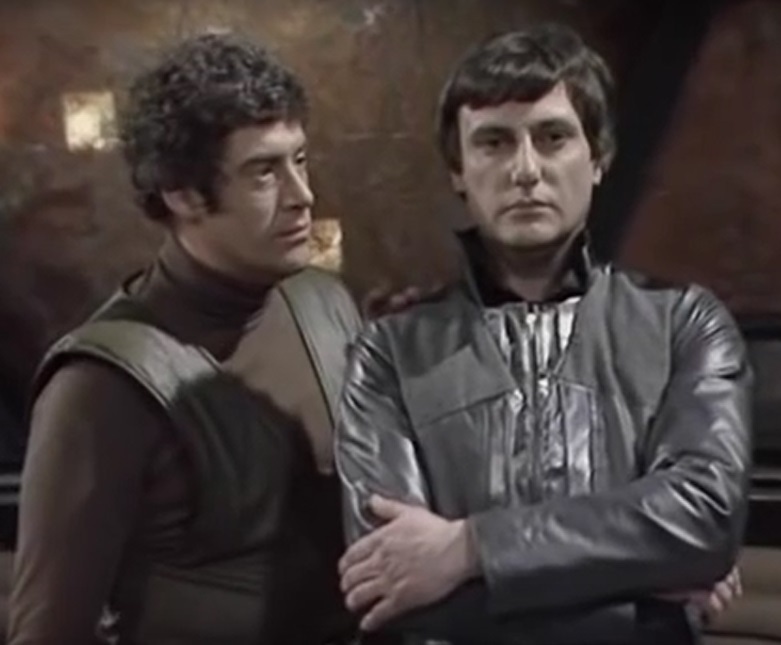 The two actors play this little scene brilliantly: Blake a picture of raw nerves and Avon a mask of cold disdain in the wake of the loss of Gan. 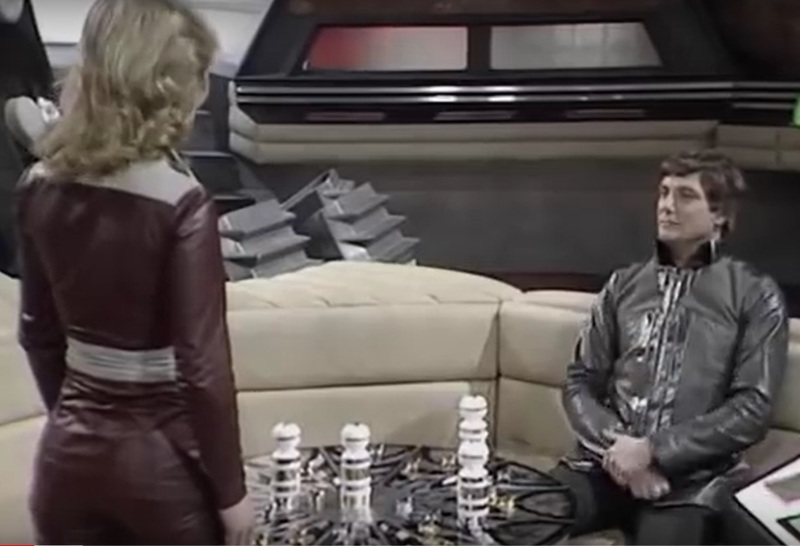 Avon continues his game with Jenna – a game which seems to involve moving different sized salt and pepper pots around a garish coffee table. Meanwhile, Blake collects his lunchbox and has ORAC teleport him down to the planet’s surface. The planet looks like a wooded area in Surrey. He leaves a little device on the ground – maybe a homing beacon – but it is swiped by something just seconds after he leaves. Back on the ship, they put together the fact that Blake has teleported himself off somewhere other than where he told them, they can’t find him and he’s programmed Liberator to take them away from him. Back in the courtroom, Travis is dismissed for the evening and the two VIPs from before give a very Shakespearean piece of exposition, explaining what the machinations of the trial could yield one way or another. It reminds me of Hamlet and the conversations at the beginning about Norway and such, letting the audience in on what’s going on. 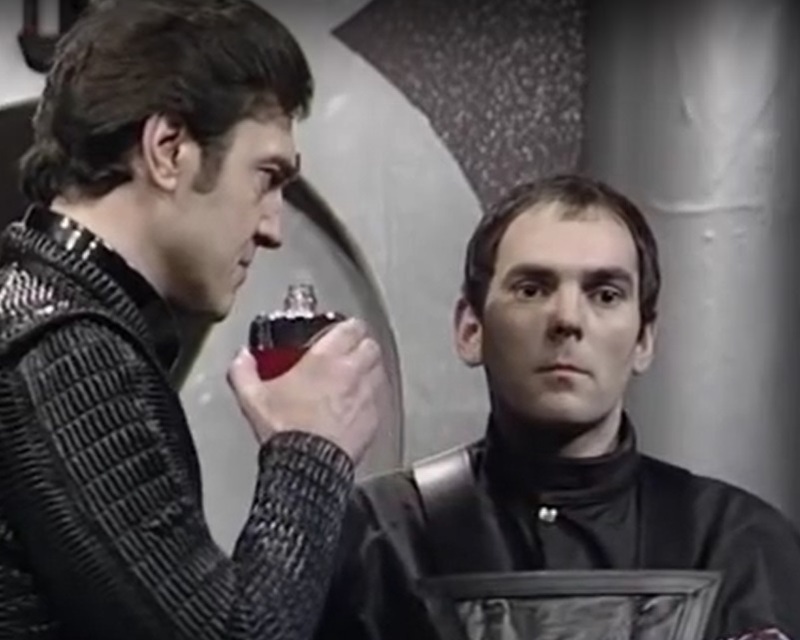 They’re trying to deal with Servalan but they know she’s a deadly foe. Sure enough, she’s watching them on a secret monitor and knows exactly what they’re up to. On Liberator, the rest of the crew are debating. 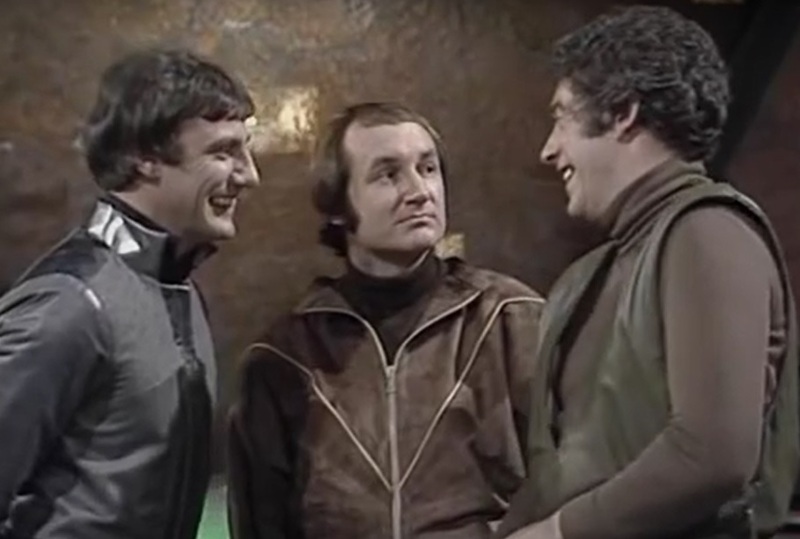 They all think that Blake has left them and Avon seems to be loving it. He’s already working on designs for the future. You can see the conflict going on inside Jenna. She clearly feels betrayed by what Blake has done and she doesn’t quite know what the right thing to do is. Before long, they uncover a message from Blake. It’s a message confessing his guilt and mixed feelings about the mission they’ve been on. He’s left a homing beacon and they can have a think and meet him there after 13 hours if they decide to stay. If he’s not there, then he’s decided to go on. I’m guessing that homing beacon was the thing that got chawed (to use a euphemism from my youth) when he landed. Avon doesn’t buy the message at all. “You swallowed that?” he says to Vila. He’s in the minority, though. The rest of the crew seem to think that the message is heartfelt. I don’t know what I’m looking at here. At first I thought it might be far away and that’s why it looks small, then I realised it’s holding the lunchbox and if the proportions are what I think they are, it could actually be a glove puppet. We’re not going to find out either, as we cut back to Travis in his cell. 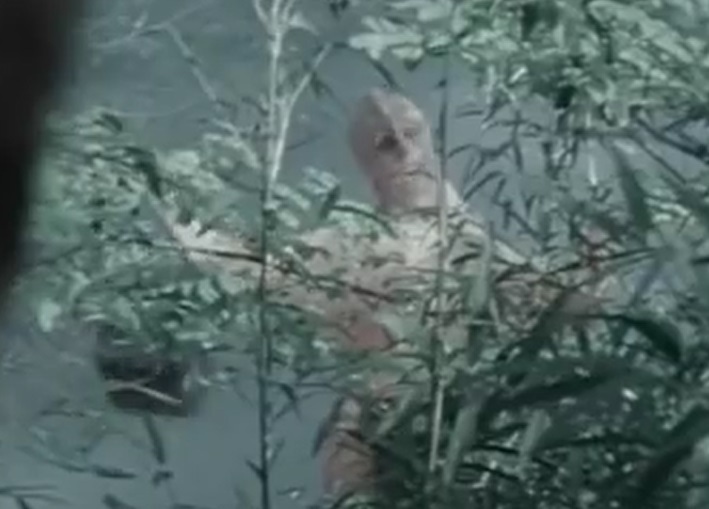 One of the grunts from before has disabled the security cameras and brought him… some after shave! OK, don’t know where this is going! Sorry, turns out it’s booze; a last tipple for the condemned man. Travis doesn’t trust him so he makes him drink some first. It’s legit though. That was nice of him, then. Oh, wait, actually it wasn’t. Turns out he was put up to it by the lawyer. 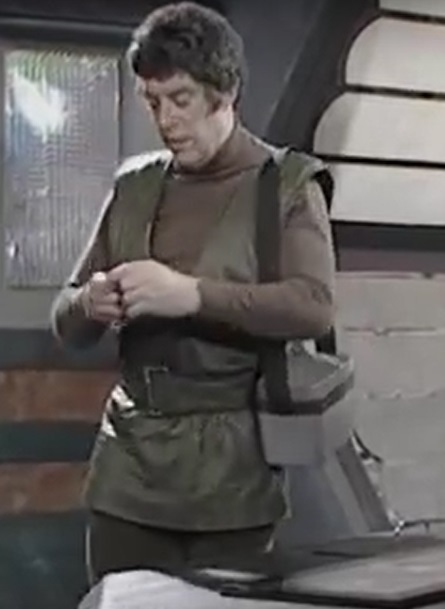 Blake’s still being, I hesitate to say terrorised; he’s still being… ‘worried’ by whatever it is that took his lunchbox. Back in prison, Travis is drunk or dead on his cot and the empty bottle is on the floor next to him. Maybe it was after shave after all. That would do it! Maybe the grunt had built up a resistance to it in the style of The Princess Bride. Inconceivable! Whoa there, he’s faking it. the lawyer walks in and is totally busted when he sits up, clear as day and says he’s been waiting for her. Plans within plans!! He tells her to get out and we go back to Blake in his life or death situation. 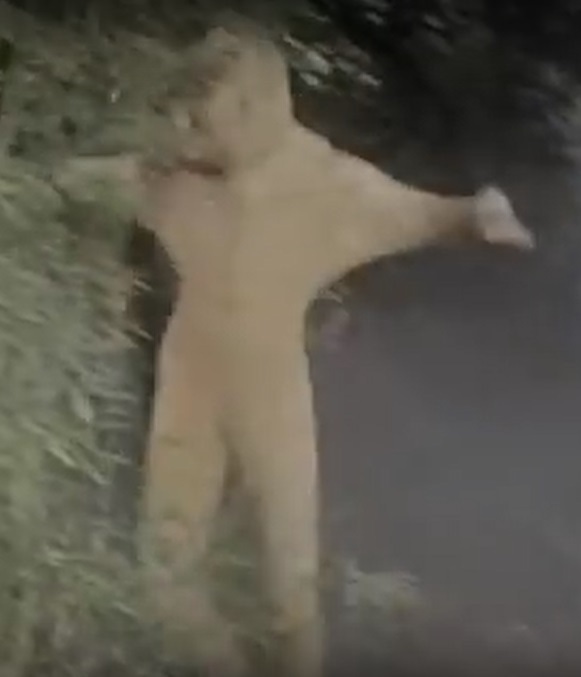 He trips over and is then poked with a stick. When he gets up, his tormentor is finally revealed. If you suffer from heart problems or are of a nervous disposition, you may wish to shut your eyes and scroll down a little. You’ve been warned. It’s a friendly little thing. however. Conveniently it speaks English and is called Zil. He follows it and we cut back to Avon, Jenna and Vila. Avon’s designed a machine to keep them invisible to the Federation and has decided to rejoin Blake. He is content to follow for now but he makes it known that this is different to being led like the others. Blake has a conversation with Zil and I’m not sure who’s more confused at the end of it: him or me? Never mind your oneness – I’m more concerned with her onesie. That’s a Halloween costume that would really have people guessing. Claire Lewis, the actress who portrays Zil, went on to appear in other things like the Quatermass mini-series with John Mills and an episode of The Bill in 1997. Either way, the crew are trying to find him and Zen tells them that the planet is about to become one big ocean. That’s a coincidence. Right now? An hour after they happened along. That’s Pitch Black level convenience. After the planet tries to literally swallow Zil, back on the ship, it’s revealed that the whole planet is one big living thing and the ocean is it’s saliva. The clock’s ticking and there isn’t enough time to wait for his homing beacon to reactivate. The planet eats Zil and Blake has an epiphany. Zil has been protecting him, thinking he’d hatched from one of her eggs. Ahh. They manage to teleport Blake aboard Liberator and Avon congratulates him on the way he manipulated the crew. It’s another wonderful exchange between these two and it’s very difficult to read Blake’s thoughts as it goes on. He never denies that the whole thing was just a way to get the rest of the crew to go on with his mission which is interesting. I do wonder what would have transpired if Jenna had overheard the conversation , however. As one of Blake’s most loyal lieutenants, I think it would have broken her to learn that he had deliberately played her. So, that wrapped up, we return to the trial. I feel like I would be happier of we were seeing more of this through the episode but I understand the need to include the crew for the sake of familiarity at the time. Travis looks seriously chilled. He’s probably the most laid back defendant since Robert De Niro in The Untouchables (well, until they switch juries, that is). Wow, and just as I wrote that, he lost it, stood up and yelled out. He tells his lawyer that he’s going to make his own statement rather than her doing it. He’s had enough of this and isn’t going to let them march him slowly and compliantly into a noose. Back on Liberator, Blake decides that they need to send a message to the Federation: a big message that reinforces their strength and ‘legend’. 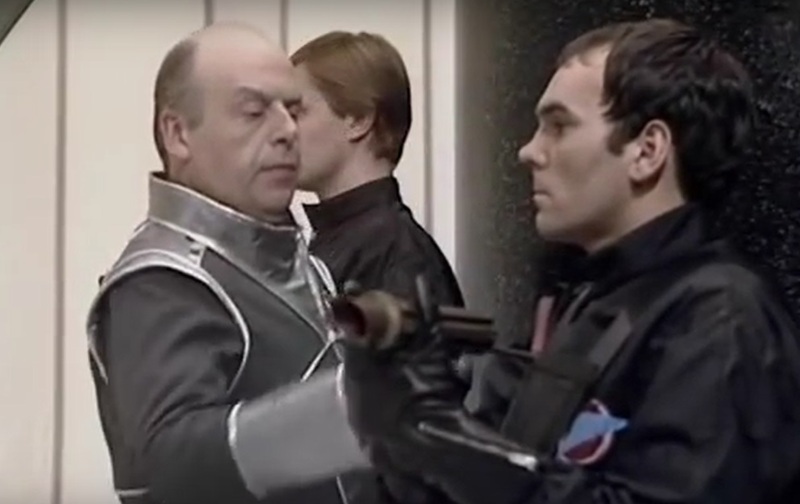 He intends to do this by attacking Servalan’s headquarters, the space station on which the trial is taking place. Travis’ opening statement is all about his strengths as an officer. His crimes were the result of his training and therefore he says everyone else is just as guilty as him. He yells it at them in fact. As far as courtroom speeches go in terms of impact, it’s less Gregory Peck in To Kill a Mockingbird and more Kurt Russell in Tango and Cash. The result is, unsurprisingly, a guilty verdict. They’re passing sentence on him: he’s to be stripped of all rank, dishonourably discharged and then executed, presumably in that order. Blake’s attack run begins and this affords Travis the chance to escape, with the help of his karate skills and jumping through doors. 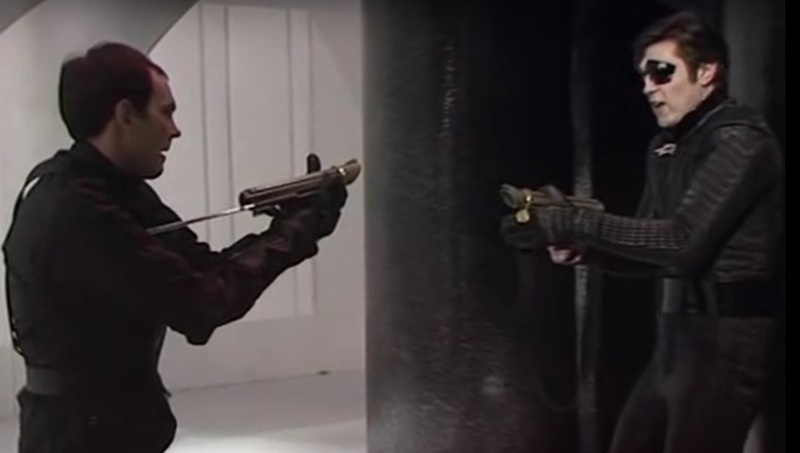 The judges are airlocked in BSG fashion thanks to the emergency failsafes and he finds his way to Servalan. He talks a pursuit ship out of her in order to make his escape so that he can go on hunting Blake. We then get one more trip back to the retreating Liberator where we are treated to a rare Star Trek-style closing scene with Blake, Avon and Vila become Kirk, Spock and McCoy for a brief second as they share a joke before the credits roll. Think Scotty in ‘Wolf in the Fold’ – For a minute there, Captain, I wasn’t sure if I’d killed the girl or not! Ahahahahahahaha!! I enjoyed this episode, although it could have been better if they had gone all out for the intrigue of the courtroom narrative rather than Blake’s trials on the planet. As I said before, however, its a testament to the writers and producers that this aspect of the story was explored in the detail it was. As I said, ahead of its time.